Whew, it's been a hot minute. Hi again friends! 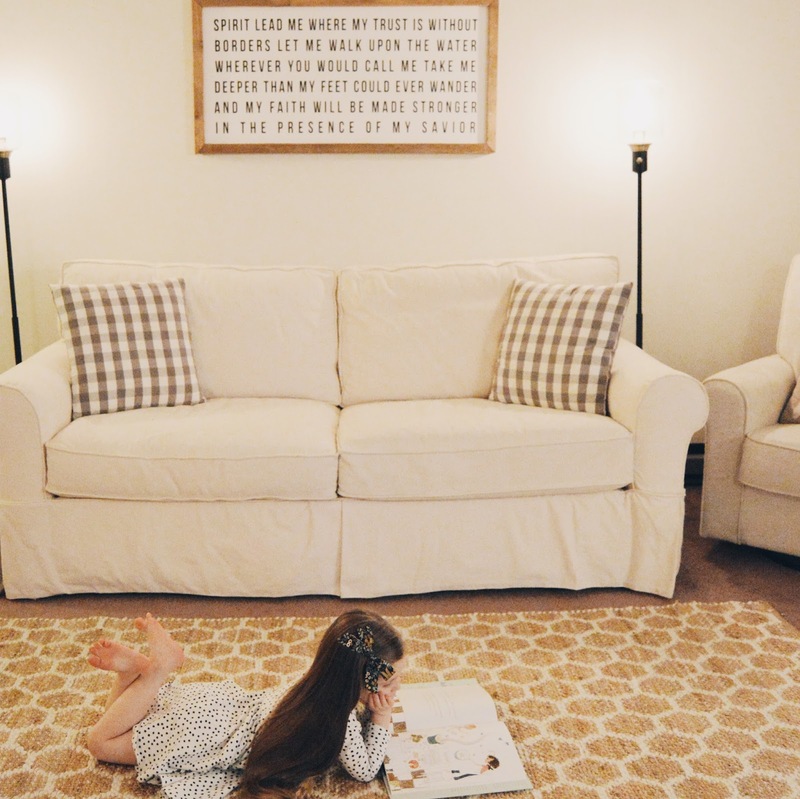 I took a short break from blogging these past couple months to focus on family and home life and I thought it was about time I left a little update here, and of course share some new favorite items that we've been loving lately. There are hints of springtime in the air, sunshine some days, all the rain the next and birds singing. 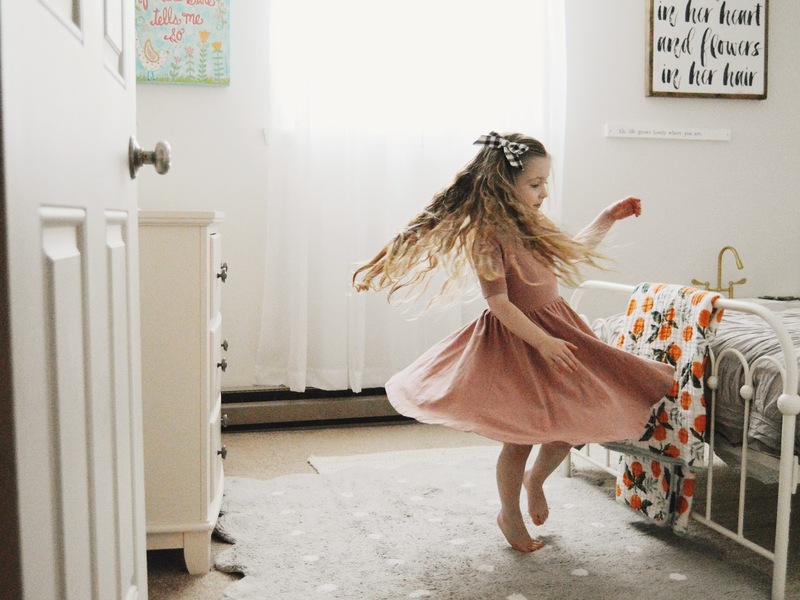 It's got us dreaming of all of the picnics, garden planting, fresh flowers and bike riding, while Bella is dreaming of puddle jumping. We all just got new bikes (mine is the prettiest light mint color) and we're really looking forward to riding them around the neighborhoods as the weather warms up. Easter is almost here, my birthday is next week and we're also going to be heading down to Missouri for a visit with my family at the end April, it's feeling like it's going to be a great spring! Last week my brother and sister in law came for a visit and of course I put my brother to work (isn't that what are big brothers for? haha) helping me put up wallpaper in our master bedroom! 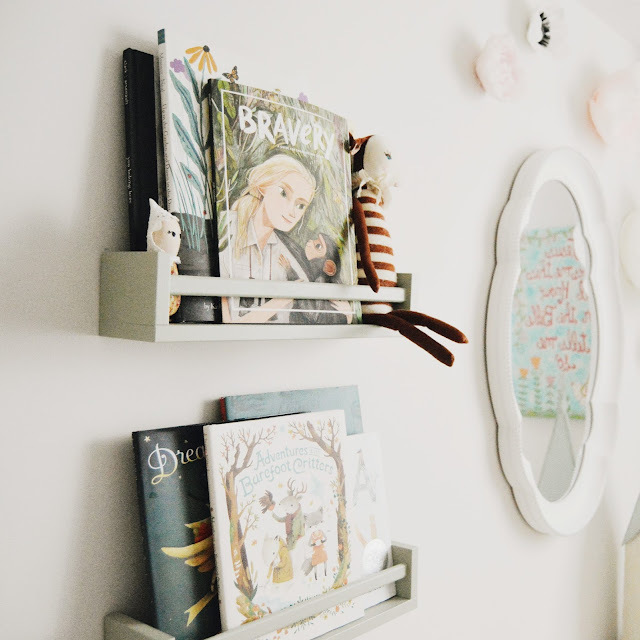 It always seemed kind of plain and I wanted to update the room a little bit and hit the refresh button. 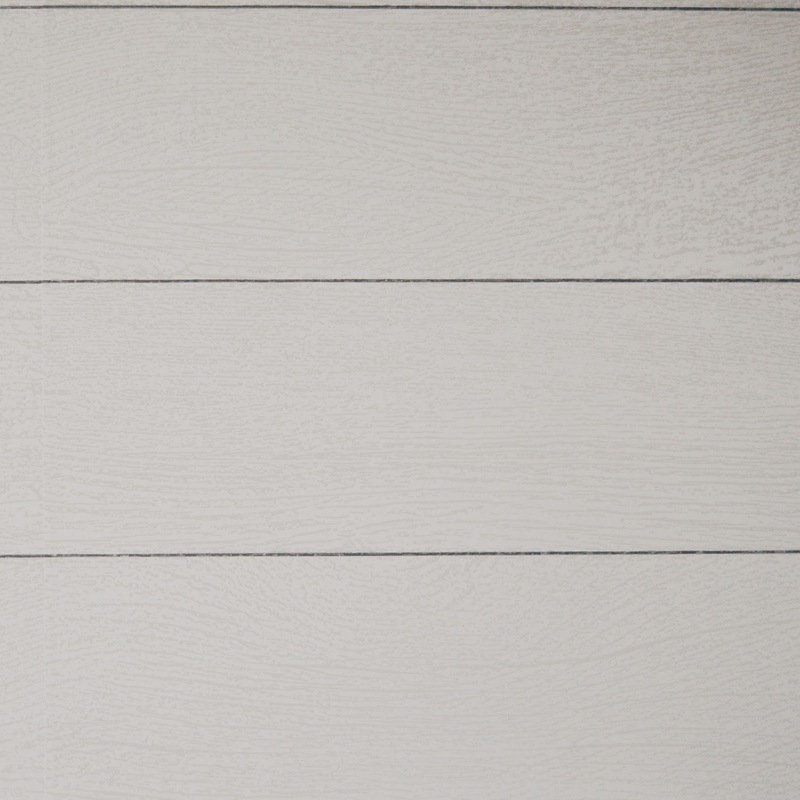 Since we rent and live in an apartment, putting up real shiplap is kind of out of the question, but there's no doubt I LOVE white shiplap, and this white shiplap peel and stick removable wallpaper from Devine Color was the perfect choice for us! 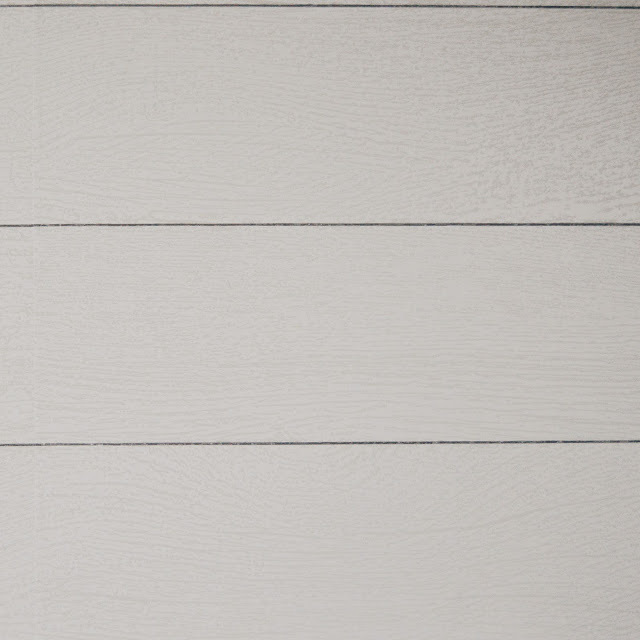 It is super easy to install (he and I put it up in under 3 hours) and looks amazing, you can hardly tell it isn't "real" shiplap without looking at it closely and it even has texture on it to make it feel and appear more like wood planks. This is the perfect solution for those of you like us who rent, but want your house or apartment to feel customized and more like a home instead of just a place you live, it gives such a personal touch that can be removed when you move or if you change your mind and decide you want to go for a different look. Your landlord may even be like ours and love it (I have a feeling he'll be keeping all of the wallpaper we've put up after we eventually move out). Honestly, this wallpaper is even great for homeowners, not just renters, such an easy to way refresh and change up any space in your home! 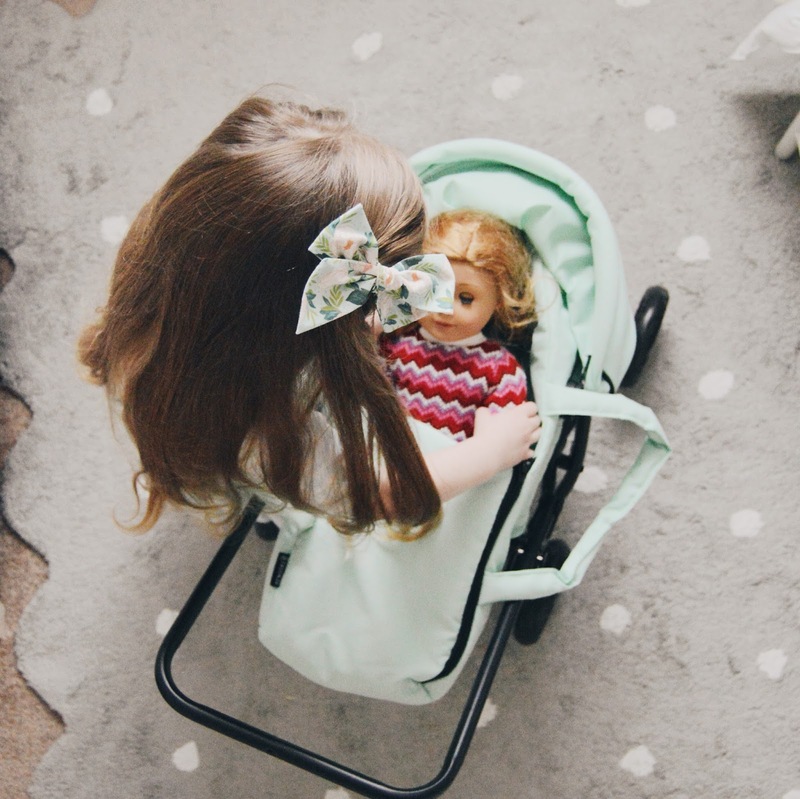 Last month, this adorable mint doll stroller from TrioKid arrived for Bella and she has not stopped playing with it since it showed up. She pushes all her dolls around all day long, and it's the perfect size for her, I just love how realistic it is, plus it's really high quality! 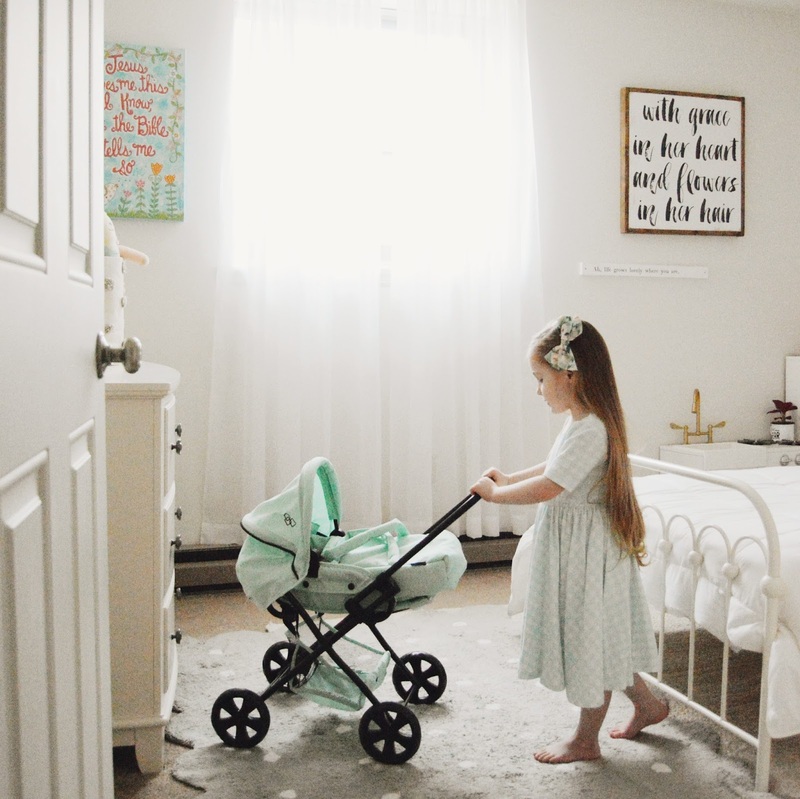 We chose the Viviline in mint which features a removable doll carry bed, an adjustable doll stroller seat, and is equipped with a big storage basket, a weather resistant canopy and a sturdy metal frame. It's designed for 16 inch to 18 inch dolls, but really works great for dolls of all sizes, Bella usually has about 5 dolls/stuffed animals in it at all times and she loves putting all of their accessories in the storage basket below the stroller. We just love the whole collection that TrioKid offers, perfect for years of play for your family, and your little ones will love them! My love of honeybees and honey runs deep. 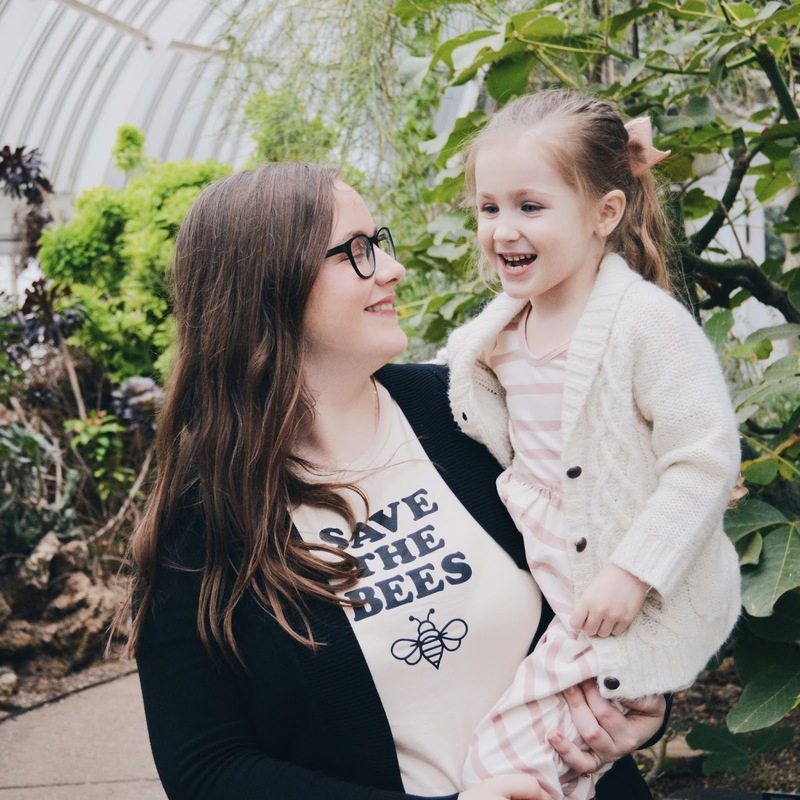 My family raised honeybees when I was growing up on the farm and I helped with them for years, so I've always loved all the things that have to do with them. Frank and I have even decided that whenever we buy a house in the future, raising honeybees is one of the things we definitely want to do! Unfortunately with the overuse of pesticides and other dangerous chemicals, bees have been dying! Which as we all know, if the bees go, so do we, because bees help pollinate all the things and keep the life cycle of plants going. So it's our job to make sure that doesn't happen, to eat organic as much as possible, grow plants that bees love/need and not use any chemicals on our garden, there are so many other things we can do to help save the bees but those are just a few big ones! 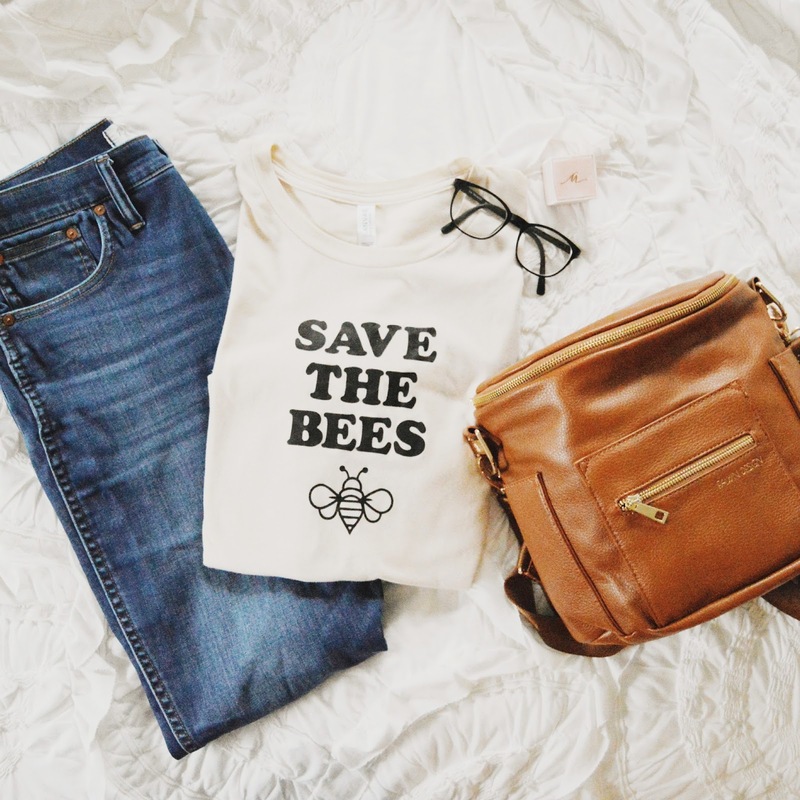 That's why when I spied this adorable "save the bees" tee over at Magnolia Roots Co. I knew I had to have it. Cute AND sends a great message and reminder. Their "Go Outside" tee is also another favorite tee design that we love. I just shared a little about Bravery Magazine on my instagram recently and we are just loving it SO MUCH. 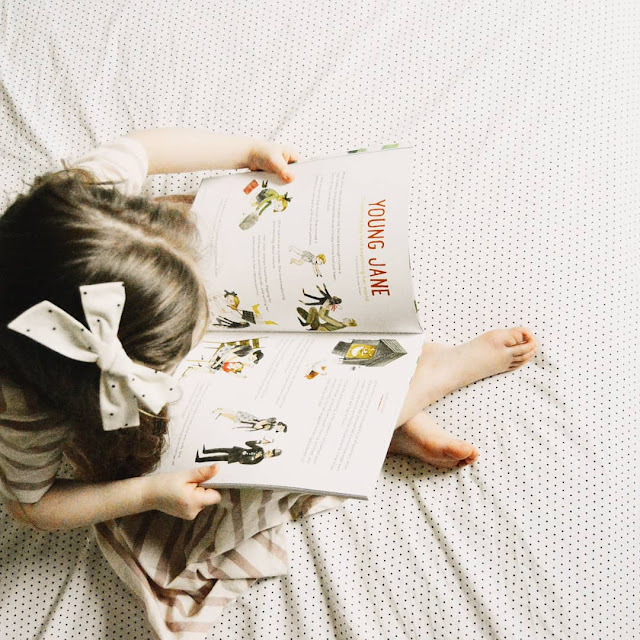 This quarterly subscription for the little ones featuring strong female role models, inspiring stories and even fun crafts! The first issue (that's available to order right now) features Jane Goodall, the famous primatologist and anthropologist! Bella just loved having her Dad and I read the stories to her and learn all about Jane, her life as a child, how she taught the chimpanzees to trust her so she could learn about them up close and her accomplishments as an adult! Issue number 2, featuring Mae Jemison, just came out last week and we can't wait to receive it! Mae Jemison was the first African American woman in space, she was an engineer, a physician AND a NASA astronaut, hows that for some inspiration? I have a feeling that this magazine is going to be a favorite for years to come! 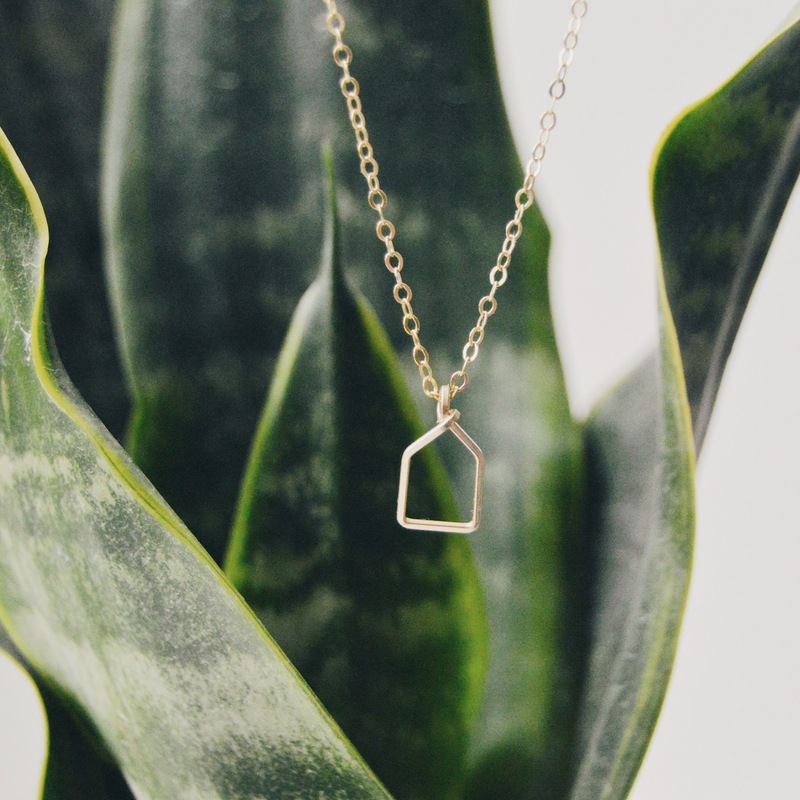 A few months back, I found the cutest jewelry on Etsy, I just fell in love with all of the simple minimalist designs from Simply Serasi Jewelry and this home necklace is my favorite (it comes in gold, silver or gold/silver. I've been wearing it practically everywhere since it arrived, and since I'm a homebody and home is my favorite place to be, I just love that wherever I am, it's always a reminder that there's no place like home but it also reminds me that home is wherever I am with the ones I love. 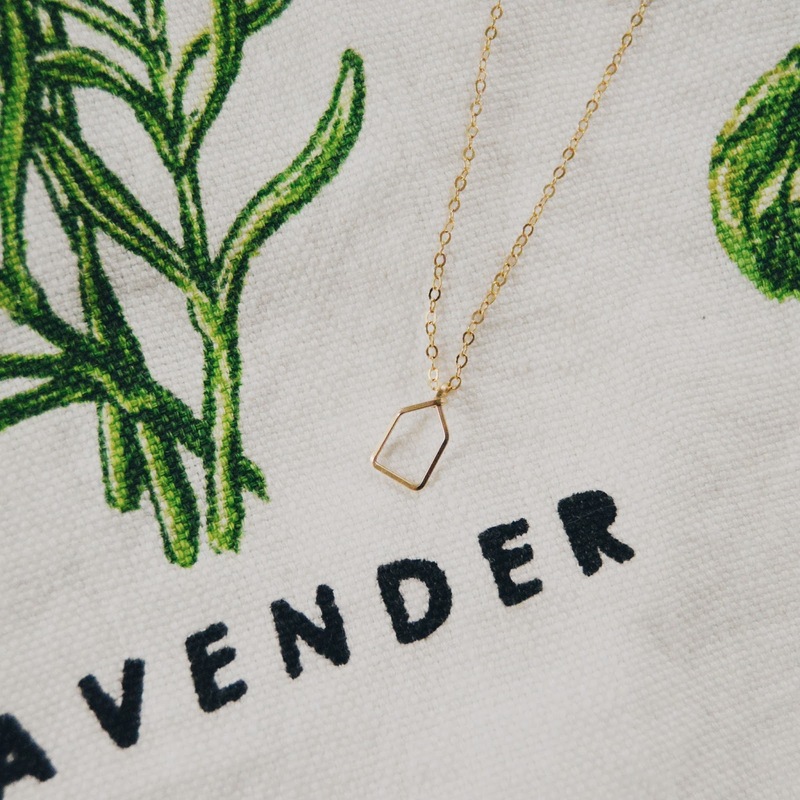 I'm fairly simple when it comes to my jewelry, I'm usually a wedding ring and one necklace kind of gal and I love the minimal statement this makes, the right amount of sparkle but simple as well. It pairs well with any outfit and if you're looking for a new go-to piece of jewelry, I highly suggest Simply Serasi Jewelry! If you're into minimalist, geometric (with a Great Gatsby feel) or cursive wire necklaces and earrings, check out all her jewelry, so much prettiness. Handmade candles are one of my favorite things, and the ones from over at Sweet Dish & Darling Candles with their pretty amber jars and AMAZING smell are some of my new favorites. 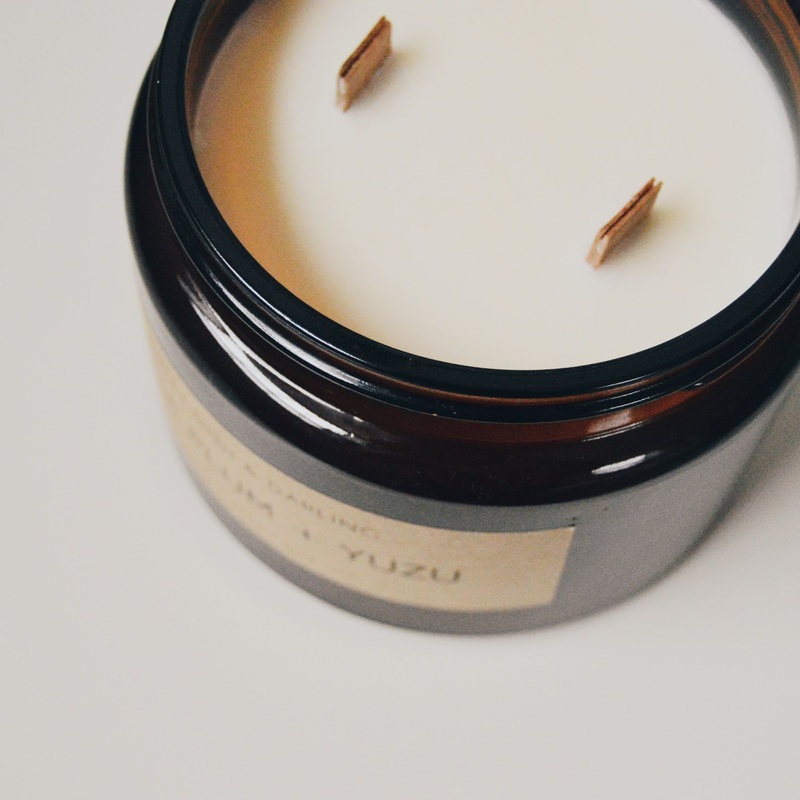 These pure soy wax candles come with wooden wicks, are made using essential oils and the highest quality fragrance oils, and they also contain NO nasty ingredients such as phthalates, dyes, zinc, lead or other additives. You can burn these pretty and amazing smelling candles to your heart's content and not worry about a single thing. We have Penumbra Moon, White Plum & Yuzu and Summer Solstice, simply some of the best smelling candles ever, not to mention that they look beautiful as decor in any room! Each purchase comes with wax melt samples of other scents they offer so you even get to try out more of their offerings and to help make that decision on what scents you want to snag in your next order! If you need me, I'll be burning these amazing candles all spring. When Frank got me this beauty of a ring for Christmas, I knew it needed an extra pretty box to be stored in! So when I came across The Mrs. Box, it was all the heart eyes at first sight. Their ring boxes which are made from custom dyed velvet, are heirloom worthy and are perfect for passing down for generations to come. There are nearly endless colors to choose from, perfect for no matter what color you best love, one is sure to catch your eye. 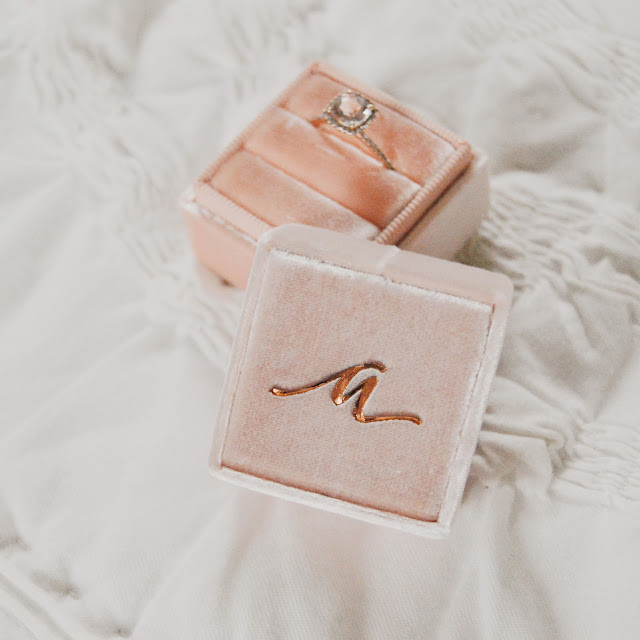 The Norah Mae color caught my attention and immediately drew me in (the Olivette is my second favorite color), I knew it was the perfect match for my pretty rose gold, pink morganite and diamond halo ring! Oh! It also looks beautiful sitting out, I keep it up on a shelf near one of our succulents and it just doubles perfectly as decor. They offer several sizes and I chose the double since it fits two rings (an engagement ring plus a wedding band). Another must have item that The Mrs. Box offers is the Gem Pen! 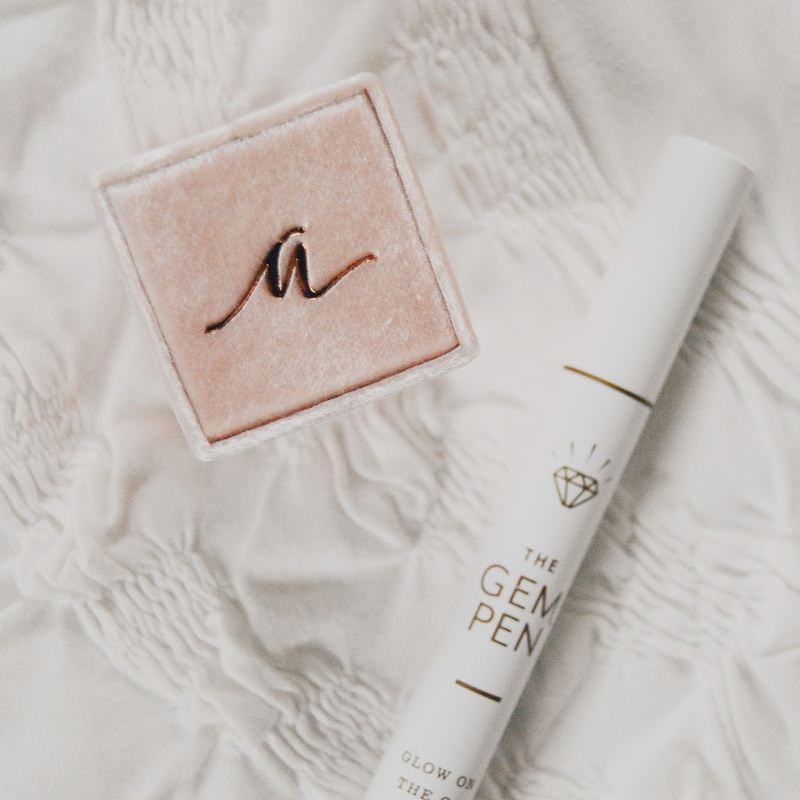 It's a lifesaver when my ring gets dirty and with the click of a pen I can clean it in seconds, perfect for on the go or anytime I'm in a hurry! 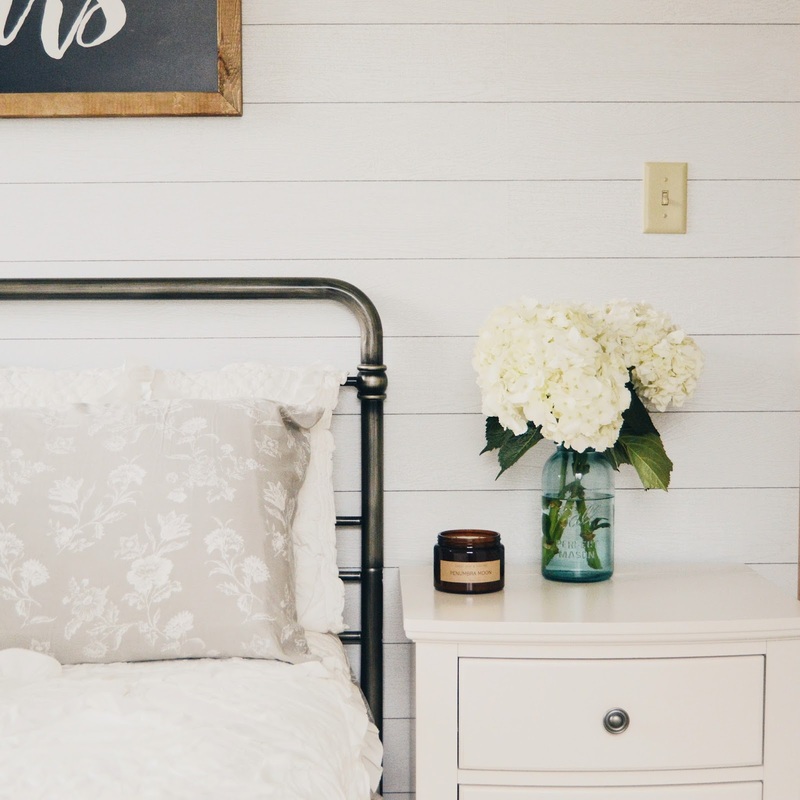 Late last year, I snagged some of the prettiest farmhouse signs from Smallwood Home, I've shared several photos of them over on my Instagram (here and here), but wanted to share about them here on the blog too. 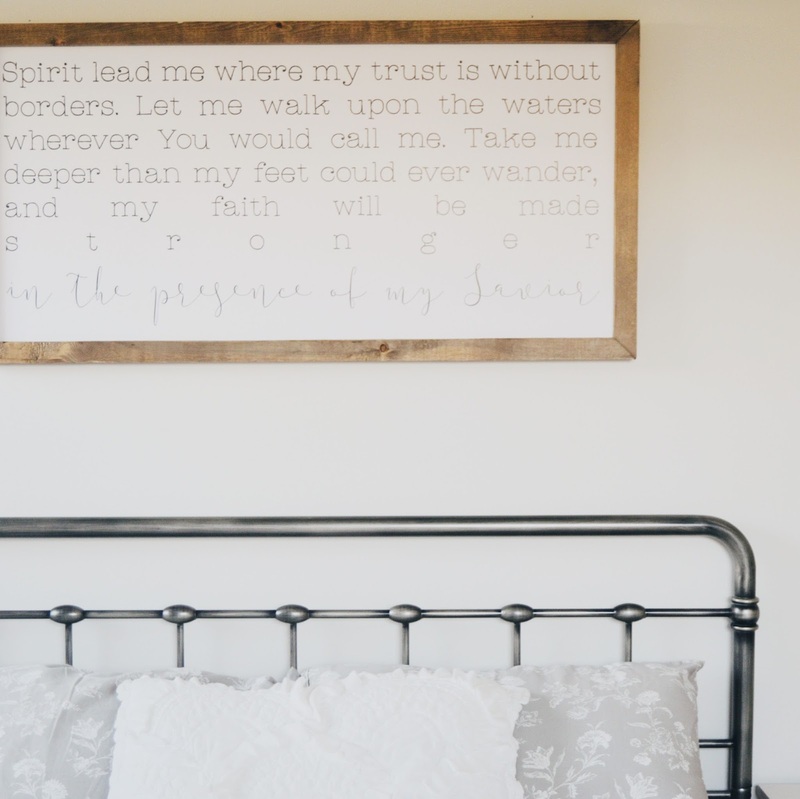 This one (here) is my absolute favorite and the one I chose (in the large size) for over our sofa in our living room, we'd been needing a statement piece for over the sofa for so long and when I seen this one I knew it was the perfect one since it's one of my all time most favorite worship songs. This "i love being yours" one is lovely over our master bed and I also chose a couple for the holidays that were perfect for Christmastime! 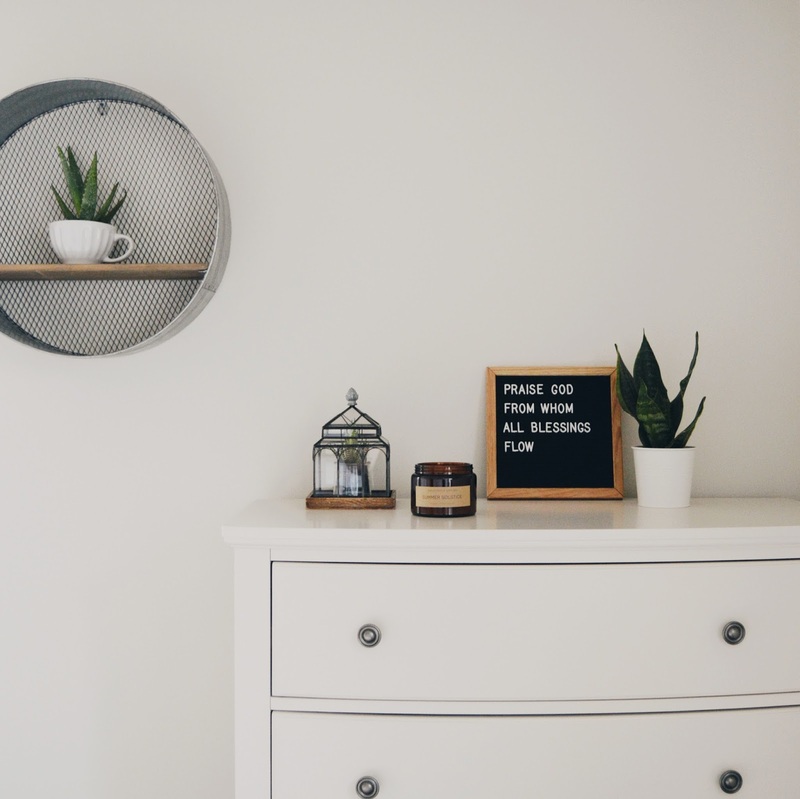 Head on over and check out all the pretty pieces they offer that are sure to compliment any home (they even do custom signs now)! 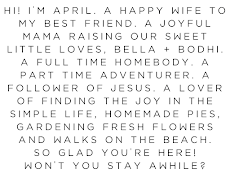 What are you loving this spring? Leave a comment sharing some of your favorites below!